The proceedings of the CIB W65 Symposium on the Organization and Management of Construction conference are presented here and in the companion volumes as state-of-the-art papers documenting research and innovative practice in the field of construction. The volumes cover four broad themes: business management, project management, risk management, IT development and applications. Each volume is organized to provide easy reference so that the practitioner can speedily extract up to date information and knowledge about the global construction industry. Managing the Construction Enterprise (Volume One): Covers the firm and its business environment, markets and marketing, human resource management strategic planning, and quality management. Managing the Construction Project (Volume Two): focuses upon productivity, procurement, international projects and human issues in relation to management performance of construction organisations. 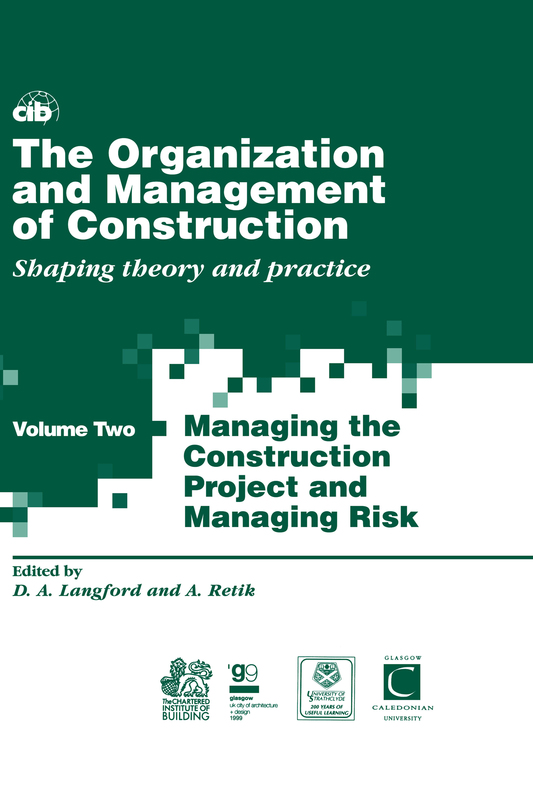 Managing Risk (Volume Two): incorporates discussion of risk away from regulation by government and those safety risks inherent in the construction process. Managing Construction Information (Volume Three, published in conjunction with Construct IT Centre of Excellence): incorporates material on information systems and methods, application of IT to the design and construction processes and how IT theory and applications are best transmitted to students and practitioners. The work represents a collation of wide ranging ideas and theory about construction and how research has contributed to the development of the industry on a global application of research to the problems of the construction industry.